In 2004, the School acquired a 260-acre parcel of farmland just a mile south of campus from Jack Blum ’47, a former trustee who raised Black Angus cattle. Six years later, Hotchkiss purchased an additional 27 acres and four buildings on the Blum property, bringing the total acreage to 287. Today, the farm has become a vital part of community life and a source of academic inspiration, providing a venue for outdoor classes, co-curricular activities, concerts, and School functions — and supplying the dining hall with organically grown produce. Hotchkiss leads independent secondary schools in its commitment to providing local, ethical, and sustainable options in the dining hall — thanks, in large part, to the seamless connection between the School and Fairfield Farm. In fall 2015 alone, Fairfield Farm supplied 32 percent of the School’s produce. We also partner with nearly 30 farmers and food producers in the region, supporting the local economy and working towards our mission of sourcing high-quality, low-impact food. And we give back to local farmers: Each year, Hotchkiss donates about 75 tons of compost to a dairy farm located just 13 miles away from campus. In 2013, Hotchkiss became the first high school in the country to join the national Real Food Challenge; today, Hotchkiss receives almost half its annual food supply from ethical, eco-conscious suppliers. 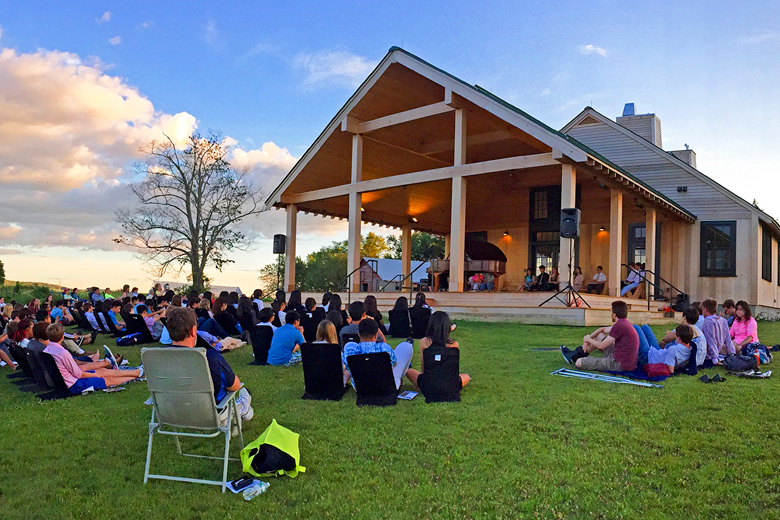 Completed in spring 2015, the grange stores the farm’s 23,000-plus pounds of produce and provides an ideal setting for student and faculty retreats, class reunions, and outdoor concerts in the summer. The building includes a teaching kitchen for cooking classes, a processing space for farm produce, and a magnificent porch.